TCM Forklift Parts - Forklift trucks are an important player in the material handling field of each and every global trade. Transporting industrial goods takes place each day on our industrious world. Primarily innovated as industrial vehicles in the 1930s in the United States, forklifts gained recognition following WWII during the 1940s. Becoming an efficient and reliable means to material handling solutions, the need and practicality of these machinery spread globally. Initially founded as Toyo Carrier Manufacturing Company Limited, in the year 1949, the company was later renamed Toyo Umpanki Co. before becoming known as the TCM Corporation. Started by Mr. N. Niwa manufactured Japan's very first lift truck. 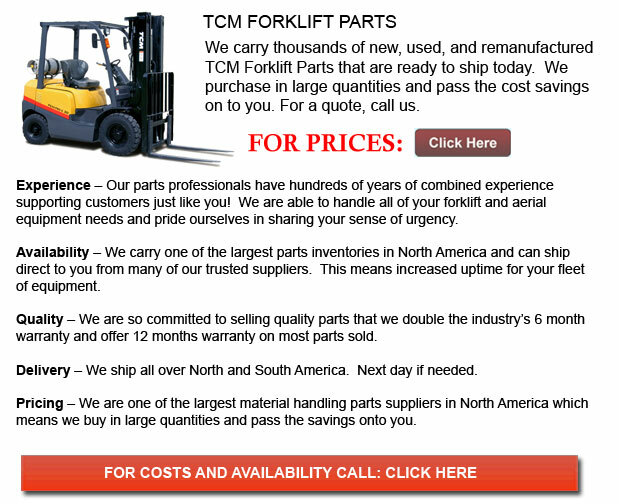 Through the years, TCM forklifts have become an international leader in forklift manufacturing and have built a solid reputation in the industry. TCM began constructing forklift manufacturing sites outside of Japan in the 1980s and is presently engaged in lift truck manufacturer at three foreign factories in Chine, the United States and Europe. TCM proudly manufactures numerous models of industrial trucks with over 50 years of accumulated expertise and technology, making their products recognized and used all around the world. Characterized by strong initiatives and energetic staff, TCM continues to look toward the future and aims to become a world-class leading business.